We can draw lot of parallels from distance running and Entrepreneurship. Running a business is like going for a run. The farther you go, the more challenges you face. It is difficult to get past the challenges, but rewarding. Most entrepreneurs will agree with this initially when you start a company there are tremendous challenges ….Finance, sales, IT, compliance, product, competition etc etc … and you cannot let yourself get bogged down by these. You have to be aware of these situations and how they will impact your business just as it is important for you to know how your body impacts you with each stride that you take and eventually find ways to get over the hurdles and come out triumph. In India we have some of the finest examples of Entrepreneurs who have built companies for the long haul. It is in keeping with the spirit of entrepreneurship that Startup Strides, a global run is organised by TiE in 10+ cities across the world to support the start-up ecosystem. The main aim of this run is to get “million steps for entrepreneurship” together in multiple bringing together leaders, entrepreneurs, corporates, students, youngsters and runners. This year the run is being organised for two categories of 3K & 5K on 4th Dec 2016 at by the TiE Chapters across Pan India & Abroad. This includes cities like Chandigarh, Coimbatore, Chennai, Delhi, Hubli, Hyderabad, Kerala, Rajasthan, Singapore and Tampa Bay. The run is focussed towards connecting people from the ecosystem together with the aspirants to support and celebrate the spirit of entrepreneurship. 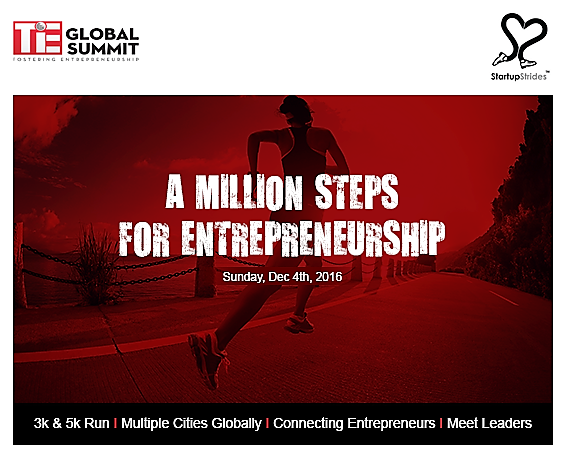 This run is in sync with the theme of the TiE Global Summit “A Million entrepreneurs NOW”. The TiE Global Summit is to be held on December 16-17 at Taj Palace, New Delhi.